the extraordinary life of an unusual soul. I am a mom with a special needs child. Join me in this journey we call life. The Straw that Broke the Camel’s …. When it rains it pours. What an apt adage for the troubles of life. I can’t speak to how others view their life, how it compares to mine. I can only speak of my life, my views and my opinions. Sometimes, it feels like I am in a world isolated from everyone in my life. I suppose that everyone feels this way at one time or another, but I am often in this isolated space. There are times I consciously put aside those feelings as they serve no purpose other than to upset me. There are times I cannot. Times when my reality is so outside of everyone else’s experience that I feel I am from another planet. I feel I am an observer, standing witness to a species of beings and their doings that is alien to me. I converse in groups of friends, family, people, and feel a detachment of connection. It isn’t anyone’s fault, there is no solution, I search for no help. It is not something that needs correction. It just is. Like the sky is blue or the sun shines. It is my life and it is different, harder, raw. I find much of my life is spent making others comfortable with our situation. They need encouragement that things are going well, that I can be happy in this situation, that my daughter is happy, and that we fit into the normalcy of what is expected of this experience called life. But we don’t. We are so far removed, that we have our own universe. So many times a friend will ask how life is going, and if I don’t respond with an upbeat, can-do attitude they are so uncomfortable and edgy that my candid answers die on my lips unsaid. Or the flip side are people who think a chance meeting in a gathering is an appropriate place to cross examine me about what is going on. Neither is encouraging. Both highlight my “different” status. Still, we are all human. I am not some perfect being, always there for the people I love and care about in the ways they need. I understand that this is the cost of being a human and living in society. We bring our disconnected good intentions with us. But it can get lonely when everyone is talking about their free mornings while their kids are learning in a safe and happy school environment. While you bring your kid to school to realize that the teacher doesn’t know how to include your her in any shape or form, and you find her facing a wall and isolated away from the rest of classmates, and all your attempts to help connect the teacher to your child is aggressively rebuffed. I might be living this unusual life for over 10 years, but I am still not completely immune to the cruelties my daughter faces. So, I find myself sobbing in a classroom, in front of a bunch of kids, and packing my daughter’s things to take her home. I find myself completely overwhelmed to be in yet another situation where our family is excluded and isolated. Where the only way out is for me to fight and claw out of a system what my daughter needs to just be able to go to school to learn and socialize with her peers. And I will do it, because I am her mother and her advocate, but I am so weary of this continual cycle. I am completely deflated, because I know what it is going to take to get her what she deserves. Lets be clear, it is not even asking for something beyond what a school has in place for my kid. It is asking for her to simply be treated as what she is. A human being. So you pick yourself up and keep going. A morning of making calls, and applying for grants, and struggling to get your kid to therapy after having wrestled her in and out of 4 different pieces of equipment just so she could take a bath, use the toilet, sit safely while you feed her breakfast and her meds. You leave message after message looking for the right path for her. You keep going, even as straw after straw is added to your back, because there is no choice. The straw doesn’t always break the camel’s back. That would be too easy. The other camels think that only you can handle the load, so they pat you on your hump and smile as you pass. Because the sky is blue and the sun shines. It just is. This started out as a Facebook post and quickly flew out from my thoughts to my page, so I’ll make it a blog instead. One of the most difficult things about special needs is when you hear, ” she needs to communicate and this should have happened a long time ago” about your child. Being a parent with a non verbal child is so much trial and error, it’s a lifetime of trying to figure out a puzzle that constantly changes shape and there is no reference picture to draw insight from. It’s knowing there is a key, and it will unlock her world, but where is the lock, let alone the key? The path to traverse is as vast as an ocean and you rarely see land on the horizon, but you know it’s there, you see glimpses of the path on the map of your child’s face. You see her determination, her strength, her intelligence, her desire to share with you. You feel helpless when you reach a dead end and have to rethink your course. You kind of live in this state of looking and trying and doing your best, but it’s never enough. There is so much more that needs to be done, but often you think, what the hell is it? You rejoice at the improvements of your child, but you cry with a bittersweetness when you try something new and it works and you realize if you had only had this knowledge years ago, perhaps she would be so much further along. I am aware that I am only human and there is only so much I can do, however, it’s not about me, it’s about her and she deserves the best of everything, including the best of me. Often people comment on my abilities as a mother, how I am “loving, great, amazing, etc” as a mom, but as much as I appreciate their love and admiration, it’s not about me. It’s about her. She is in a body that is out of her control, she has to work so hard just to do a shadow of the movements that she wants to do, but she never, ever, ever gives up. Ever. It might take her 5 minutes to lift her arms so I can place her tray, but she works hard to be independent and does it so I can place her tray and she rejoices at her accomplishment. I hope people can look beyond me, beyond her body, and see the little determined, amazing soul that she is. It’s not always easy, she can’t control her body enough to interact in a typical way. It can be uncomfortable, awkward even, when you talk to her and she doesn’t immediately respond as she processes who you are (many people expect her to smile or say hello when they meet her for the first time). She needs time to process you , what you say and how you fit into her life. She needs you to speak clearly and slowly and look directly at her at her eye level. She needs you to show your warmth and maybe hold her hand as you greet her and tell her who you are. She needs me to figure out how she can have a dependable and clear way to communicate back. She needs her team, both private and school based, to help with this process. There are wonderful people in her life who believe in her abilities and are working hard to help her. My prayer is that we help her sooner than later. She deserves the best from the world, for that is what she gives the world. I am here to help her. Always. May God help me. There is an aspect to a life of special needs that is sometimes difficult to endure. The educating of the masses. Whether it is simply explaining what my daughter’s condition is, or being patient with well-meaning, yet heart pinching, words or actions. Let’s talk about this for a minute. Yes, this course of action is better than simply staring at my wheelchair bound daughter. It’s better than shushing a child who is pointing, or laughing, or jeering. It’s better for your child. They get to learn about people being different, they get a teachable moment to help them become more accepting human beings. Let’s think about my child. She is simply that. A child. She doesn’t need to be a lesson. She needs friends, laughter, and love. She doesn’t need her differences talked about with every single new person in her life, right in front of her. I have a friend who teaches her son and daughter inclusion at home . She talked about how there are many different kinds of people in the world long before my daughter was in their lives. After she met me, she talked to her children before they met my daughter. I wish more parents took her initiative, because sometimes I am tired of not being able to just be a family in public. I am tired of my daughter being held up as an example to everyone on being different and on inclusion. It’s exhausting, it’s isolating, and at times it can be hurtful. I was recently asked if I would bring my daughter in to spend time with a classroom of children. My daughter doesn’t go to this school, she is a 3rd grader and has no reason to be there in a preschool classroom. I carefully explained that if my daughter were typical she would not have been asked to visit this class, I explained that I try and keep her life as typical as her conditions allow. I explained that she was just a child, not an experience for other children to have. I know all of these situations come from good places. People trying to help, trying to make the community/world a more educated and inclusive place. Yet, it isolates and objectifies. It takes my daughter’s very right to be a person away. It makes her an object that people are obliged to interact with. I suppose it is a very fine line. I can see how it’s difficult to know the right way to behave around a child like mine. So this is my small way of letting you into our lives, of helping you understand how important it is for my daughter to not be objectified, to allow her to just be a child. Talk to her like you would any other child, teach your children that people who are different on the outside, are still the same on the inside. Ah, advice. After nine years of raising a special needs child, advice is a trigger. Aren’t we all guilty of giving advice? Don’t we just know what will help? Well.. No. Unless you have cerebral palsy or have a child with CP, you don’t. After 9 years of caring for Wawoo, I no longer give people advice about their kids. I’ve learnt that we can’t possibly know what someone else is dealing with, what works for us isn’t everyone’s fix. A woman once told me that I was closed-minded and that I was missing the opportunity to “cure” my child. She believed in miracles. As if my not believing that there is a cure was holding my daughter’s health and life back. Didn’t she know that if I could believe Wawoo’s condition away, it would have left as soon as it manifested? When people throw their remedies in my face and swear that it will help, because they know a cousin, uncle, friend who has, (insert any and every condition not related to CP), and they were cured or normal, and if I would just try it I would see. Wawoo would be normal, it’s just a matter of trying their miracle. I don’t disbelieve that remedies can help her symptoms. I know there are natural treatments that can help alleviate her ailments, but there isn’t anything that can reverse her brain damage. Believe me when I say I’ve looked for treatments, I’ve researched her condition to the fullest, I’ve tried many things to help with her symptoms. 9 years is a long time and I’ve been busy all those 9 years. Then there is the guilt aspect of these interactions. If I’m not suitably grateful for this unasked for advice, the giver is often offended. Never mind, that I never asked for the advice, it came from a place of love. They only wanted to help. I’m being ungrateful. This love is a burden. I neither asked for it nor need it. More often than not, it’s from someone who barely knows us, who doesn’t even bother to ask me what my daughter’s condition actually is. If you know a person with special needs, or a family with a special needs member, don’t assume that they can be “cured”. They are not looking to be typical, they are looking for love and acceptance. If they don’t ask for advice, don’t give it. Especially if you barely know them, or don’t know what their condition is. Just be a friend. Trust that if they need advice or are looking for something to help, they will let you know. Today, I looked in the mirror and saw the woman reflected back at me. She was no longer in the bloom of youth, yet neither was she in the fall of her life. She looked sweet , tired, content, sure of who she was. Yet, there was a sadness in the depths of her eyes. I could see a life well lived, although they numbered only 33. I could see the joys she experienced in the lines around her eyes. Those eyes looked ready to crinkle at the slightest provocation. I could see the tragedies in the solemn lines of her expression and the empathy found there. For how can she experience suffering and then not hurt for those who suffer around her? She had wild curly hair. It seemed to reflect the tumult of emotions she carried around in her breast. Threaded in that hair of ebony, were strands of silver. I saw her reflect on the dear soul who had left her life, suddenly and painfully. I saw that she had expected to tease him about the silver he was suppose to sprout one day. How she expected to be an old woman surrounded by loved ones, peaceful in the knowledge that she was to go before him, but life is an unexpected beast at times. This soul was ripped away from her life. From the lives of those she loved, who loved him as she did. They were all left behind, feeling alone and forgotten. Like a child’s toy, once loved, but now sitting at the bottom of a toy chest. In the mirror, I looked at this woman’s body. It was twisted and broken, strong and erect. Her body bore the marks of caring for her daughter. It showed her love of a soul trapped in a body that doesn’t work. It showed the strength of heart to continue to lift, cradle, and nurture a body well beyond infancy. I also saw the compassion she had, in the stoop of her shoulders. How those shoulders were rounding down to comfort her child against her breast. Never minding that her child was nearly her size. So, even twisted and broken I saw the beauty of love in that body. I saw the toll of emotional stress on her body. How over the years she had put her needs behind everyone else’s needs. However, I also saw the signs of her pushing herself to the front. I saw her muscles defining themselves with exercise. I saw the leaner lines from the nutritious food she ate to nourish both her mind and body. I saw in the mirror, a woman well loved. She looked content, a product of the support she received. I see her family and friends reflected in her slight smile, in the peace in her eyes, in the jewelry that marks her body. A ring from her beloved, a nose pin from her mother, a necklace from her heart sister. Her features reflected her siblings and the love she carries for them. I see her sisters in her eyes. One brother in her forehead, another in her cheeky faces, and the other two in the length of her eyelashes. Her mother and grandmother were the structure of her face. There is so much strength and love in those features. Reflected in that face I can see her search for God. It is stamped in the clay on her forehead. I see her connection to God in the earth under her nails. That earth tells me she finds joy in the nurturing of God’s natural form. She admires it like no other part of Him. I look at this woman in the mirror and she smiles at me, as I smile at her. We both take a sigh and, as one, turn away to continue on this path called life. I know I will see her again and she will be changed and different, but I will know her as she is, always. Something has been ruminating in my mind for some days now, ever since our last family visit to our temple. The amount of effort and emotional endurance that goes into taking your special little one to a typical function, gathering, activity, is a lot. 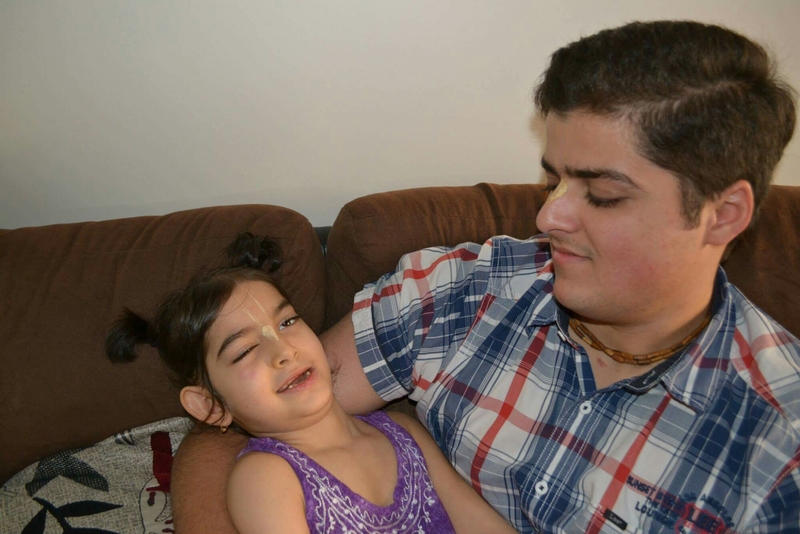 For example, taking my child, who is wheelchair bound with cerebral palsy, to our local temple is an effort. Not only do I have to make sure I have everything to meet all her needs, preparing her for the overstimulation and having things handy to de-stress, feed, and keep her cool, just to name a few. I have to also prepare myself for the ordeal of maneuvering her wheelchair around shoes, people, objects etc. On days where the temple is so full of people I can barely get her in and out, I wonder at my need to include her. But there is a need. A need and a want to include her in typical activities, I want her to be a part of our community, our community needs to know her and accept her, I feel it’s important for both us and them. However, it’s almost never a satisfying experience. I won’t be a negative Nelly and say I have never had a successful experience. The truth is, we have wonderful friends and they make sure we are assisted and welcomed wherever we go. No, I’m talking about the greater community. I would like to preface my explanation with this: we are not needy parents, we try our hardest to meet our child’s needs without imposing on someone else. We are strong and resourceful , we only ask our closest friends for help and often they know us enough to know that we won’t ask for help, so they simply anticipate our or our daughter’s needs. We are blessed and fully appreciate their love and support. When I say community, I speak more of acquaintances, or perfect strangers who see us from time to time in the temple setting. I would like to share with them my heart. My daughter is in a wheelchair and might seem to not be paying attention to what’s going on, so maybe you feel she doesn’t need to be in the temple, taking up space, or up front to have a good view, but she does. You see, she is over-stimulated by the noise and crowd, but she is aware, seeing and hearing everything. She is absorbing as much as you are and when you disregard her by asking me to move her out of your way, so you have a better spot, you are both breaking my heart and telling her she is not equal to you. But she is. She is a spirit soul, just like you, just like me. Her body might be broken, but we are not our bodies. Her mind and her intelligence are there, she is seeing how she is treated and that is molding my daughter’s perception of herself and how she can expect the world to treat her. Just like any other mother, I want to raise my daughter to be strong and confident. I want her to know she is valued, she is lovable and that she can reach for her dreams, despite her limitations. So this is a request to you , her village so to speak, please allow her to be a part of this temple community. This doesn’t mean you have to rush to help us, this doesn’t mean you have to give us priority. It simply means, please give us respect, allow her to have space to join in. Please don’t bump into her wheelchair as though she were a piece of furniture. Please don’t stare at her and then look at me with pity, we are proud of our daughter and her accomplishments. Please DON’T leave your shoes in the doorways and hallways where we have to fight to simply get her in the temple. Please DO say hello and smile at her. Please DO remember that she might not know you, and like any child will not smile back. And most of all please DO remember she needs her relationship with God just like you and I, please allow her to see the Deities, allow her to help in service, please don’t disregard her right to be there. Dealing with grief is something we will all go through at some point in our lives. Yet, it seems like it’s the thing we are the most ill equipped to show comfort for. Our intentions are to give comfort, to show support, compassion and empathy, but more often than not it seems we cause more pain or hurt. Why is it so hard to say the right thing? Why is it so easy to say something hurtful, even unintentionally? Since my brother passed away, it feels like hell. Losing him, dealing with life, worrying about your family, trying to understand how and why this would happen. Then on top of all of that, bracing yourself to deal with people. People who care, people who don’t, people trying to comfort with truisms and quotes, sad eyes and meaningful squeezes. It’s all from a caring place, but you kind of cringe and or get angry. Those things are expected and a way of avoiding them is to keep to yourself. Stay away until you know you can handle it and see the love behind it. It cheapens the intensity of your feelings, you feel violated and defensive. It feels like they are telling you that they know and have felt what you are going through, when really they couldn’t possibly know and all they accomplish is reminding you that you are alone in your pain. I recently read a post from a mother who lost her daughter at a young age, in a violent manner. She mentioned one of the most difficult things after her loss was how people felt they needed to comment on how she didn’t do the right things to prevent what happened. When I read that my heart squeezed shut. At a time when this poor women was dealing with the most horrific thing a mother could go through, people were tearing her apart, laying the blame at her feet. It’s human nature to say and do things that make you feel better about a situation, you rationalize situations so you may feel safe from those random atrocities happening in your life, to your loved ones. It doesn’t work that way, and in the process you are creating a situation where you are putting guilt where it will already lay. Loved ones left behind will always feel the burden of seeing what “could have, would have, should have,” been done. It’s a curse and unfair. Hindsight is truly 20/20. Why add fat to the fire? Isn’t better to give that person the comfort they are desperate for? Isn’t it better to simple hold someone, cry with them, soothe them by allowing them to express their great loss? Today I went to visit a woman who has been in my life since nearly birth. She knows my family, knew my brother. She held me tightly as tears poured down my face, she told me memories about him and I when we were young. She shared in my grief and simply felt what my family was going through. She said not a word of “understanding”, she said many words of loss and love.